That will pretty much do it. Lewis Hamilton eased to victory in Japan to win his 9th race of the season and move within touching distance of his fifth world championship. Once again the Ferraris faltered without putting any real pressure on Mercedes. The only challenger to Hamilton’s title, Sebastian Vettel, had a weekend to forget. The German lost the gamble in Q3 on Saturday as the weather changed one way and back again, leaving him to qualify 9th before making some errors on Sunday which cost him dearly. Even Kimi Raikkonen was unable to make any impact as the Red Bulls took 3rd and 4th. This was an even bigger blow to Ferrari as one of those, Daniel Ricciardo, finished above them despite starting in 15th. 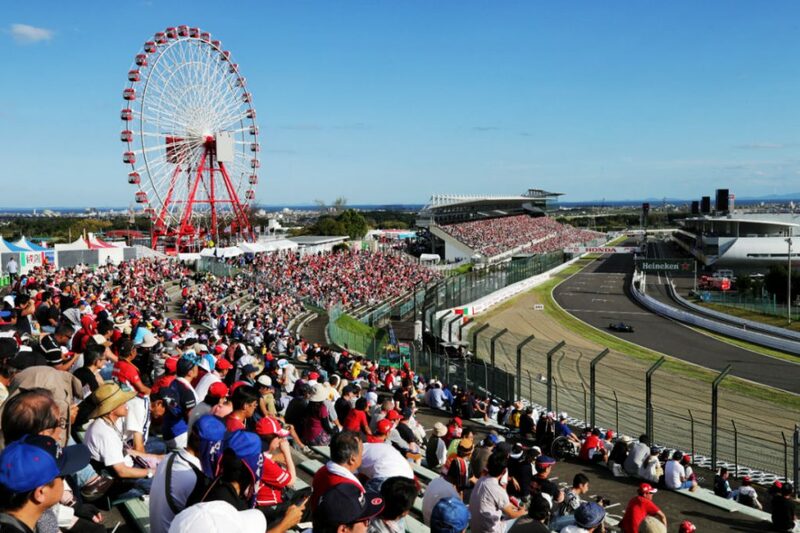 The race itself was not one of the most spectacular but Suzuka remains a favourite for drivers and fans alike. So much so it brought Hamilton to giggles in practice earlier in the week as he declared his love for the track. Formula 1 celebrated 30 years there this weekend and there will be more to come with a new deal in place with owners Liberty Media. Qualifying was a bit more entertaining mainly due to the unpredictable weather. 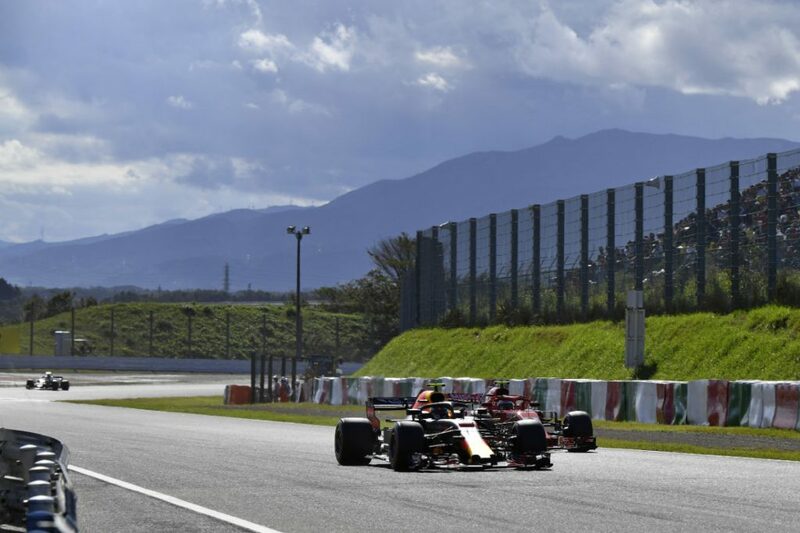 Vettel had a little spin before Marcus Ericsson ended his qualifying and brought out the red flags with his spin across the grass and into the barrier. Red Bull’s sister team, Toro Rosso, were having a fine qualifying. With their new Honda engines, in the manufacturers home race, Brendon Hartley and Pierre Gasly put their cars in 6th and 7th respectively. At the top end Mercedes were fine and were comfortable in getting their front row lock out. Ferrari on the other hand completely messed it up. Firstly, with the rain imminent, Ferrari sent out Vettel on intermediate tyres in the hope the rain would come early, but the track was bone dry. Everyone else was on the slicks and put their quick time in before the heavens opened. By the time the rain did come, Vettel had only done one lap on the slicks, which left him 9th. With the situation they are in, it is not hard to see why Maurizio Arrivabene would have felt they needed to try something drastic, but this was some way from coming off. With it all to do, Sebby started the race quite well. He managed to get up to 6th very early on, before getting past Romain Grosjean, who had qualified well in 5th. Just in front of Vettel was his teammate, who was challenging Verstappen. The Finn was hot on the tail of the Red Bull and saw his chance as Verstappen locked up and went off the track, only to come back on and nudge Kimi back off the other side. This allowed Vettel through in to 4th with Verstappen being handed a five second penalty. There was the first chance at the comeback for Ferrari. Another opportunity presented itself when the safety car was deployed. Charles Leclerc shunted Kevin Magnussen’s Haas, causing a slow puncture that sprayed debris all over the track. When the race resumed, Vettel went on the attack and made a fatal error that not only cost him a chance of a podium, but most probably ended his title hopes. With 3rd place in touching distance, Vettel tried to duck down the inside of the Dutchman and ended up going into the side of him, bumping enough for his Ferrari to spin and rejoin the race at the back of the grid. 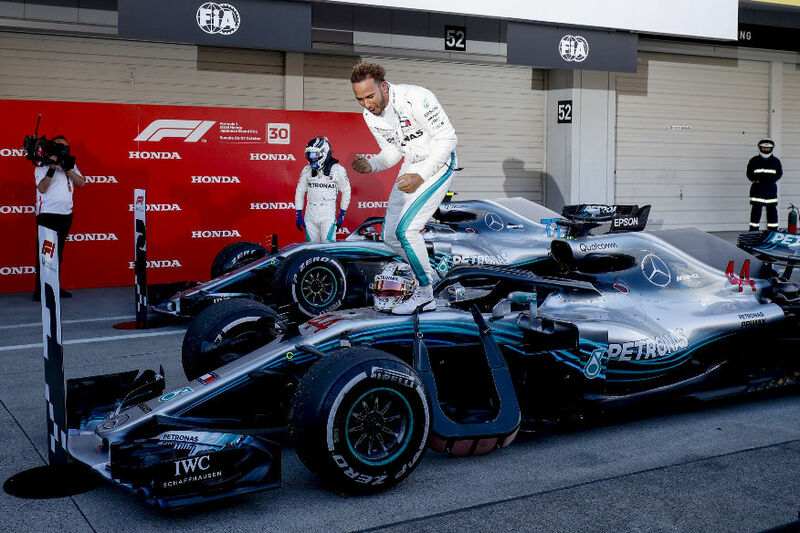 David Coulthard summed it up perfectly when he said in his commentary that it was ‘a desperate move by a desperate man’. Ferrari’s issues were not just with Vettel’s drive. They were the first of the big guns to bring someone in to the pits as Kimi went in. When he come back out, it was in lots of traffic. This cost him dearly as Verstappen was able to pit soon after, serve his 5-sec penalty and still come out ahead of the Ferrari. 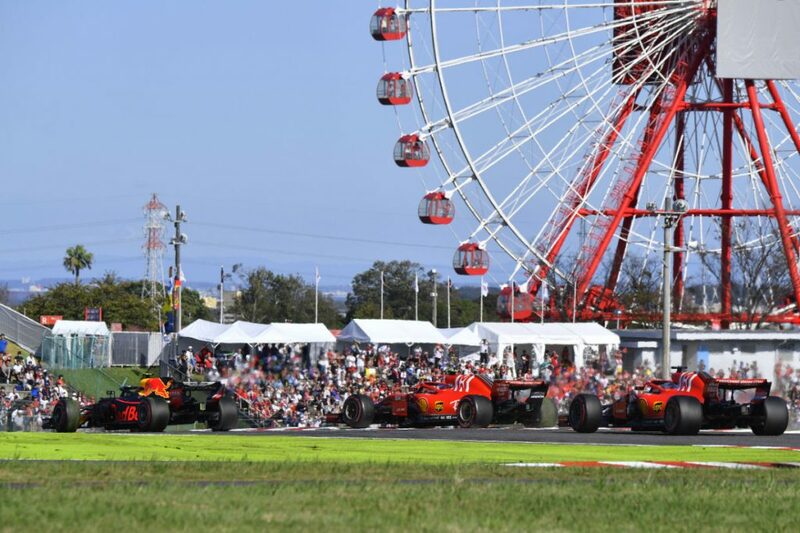 To make matters worse, Ricciardo, who had started 15th, had climbed his way up the grid and was able to pit and come back out in front of Raikkonen as well. A double blow for Ferrari. When Vettel finally pitted on lap 28, he came back out in 16th. The German managed to get back up the field but found himself 40 seconds behind his teammate with just over 15 laps to go. There was a small threat of a change near the top of the pack. Verstappen was chasing Bottas and at one point came within a second of the Finn, but the Mercedes was able to keep a fair amount of distance away from the Red Bull. There was some speculation that Ferrari may switch their drivers so Vettel could get more points and it looked like it was going that way. Despite the huge time between the two, Kimi was slowing down as the race went on. In the end he kept 5th place. It looked like a tell tale sign that all hope was lost. 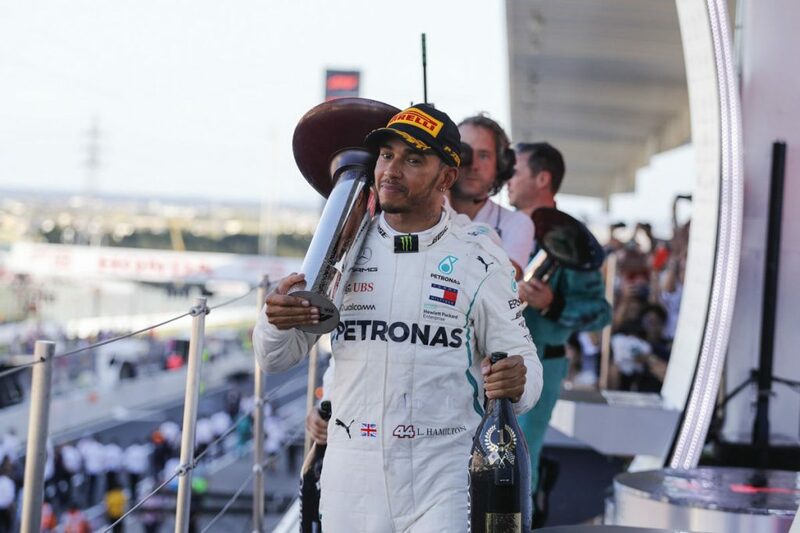 The result meant that Hamilton cruised his way to his fourth Japanese GP win in five years, notching up the same amount of wins this season as he had in the whole of last year. The Brit now leads the championship by 67 points, meaning he can win his 5th World title if he outscores Vettel by 8 points in the next race. A win for Hamilton in Austin, Texas, where he has won the last four, Vettel will need to finish 2nd. As we head Stateside I think of the famous phrase from Baseball legend Yogi Berra who said “It’s ain’t over till it’s over”. Well, this one looks like it is over.